Interwoven with gospel music, Gee’s Bend, a heartwarming and powerful play by Elyzabeth Gregory Wilder, celebrates the human spirit. The inspiring story of the women of Gee’s Bend, Alabama, who sew quilts that turn out to be magnificent works of art, and their deeply personal journey which parallels the turbulent history of African-Americans in the 20th century. The true story of these wonderful women has already touched millions who viewed their stunning quilt work through a national exhibition tour and features in Newsweek and Oprah Winfrey’s O Magazine. The play runs through April 9, so if you're in the Cincinnati area, I encourage you to check it out. 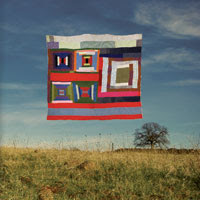 I've recently been reading about Gees Bend quilts and am so intrigued by them! Enjoy the play! That sounds wonderful! Is there a book? It was really good! It was more about the lives of the women growing up in the rural south, the civil rights movement, and the change brought to their lives when their quilts were displayed as works of art, than about the quilts themselves. Lori, I'm not sure if there is a book or not. I highly recommend seeing it if it comes near you!